My Mom has always loved ornaments. 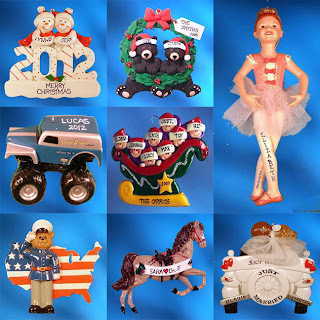 As a child we would start our ornament shopping the second Christmas items hit the shelf and we wouldn't stop until all the Christmas clearance was gone. Our Christmas tree was always filled with special ornaments that had meaning; not just boring colored balls. Then, several years ago we decided to purchase a dated ornament every year. I moved out of my Mother's house over 10 years ago and she is now disabled and not able to shop easily. So, I have carried on the tradition and purchased one for her every year. I discovered an amazing company a few years ago called Ornaments with Love and I knew that I was set in the ornament department. Another cool thing about their website is that a lot of the ornaments are customizable to your family size. For instance the sled shown above can have anywhere from 3 to 10 people in the sled. I love that they have ornaments for large families too. First of all, I want to say that they had incredibly fast shipping. Most of the time when I order personalized products it takes weeks or even months. I had this ornament in my hand a few days after ordering. Incredible! They also package it really well and include a little gift bag for you to give the ornament as a gift if that is your intention. As for the ornament itself, I adore it and I know my Mom will too. It is so perfect for her! My Mom loves bears. I have my Mom and Dad's names for the large bears and my little Brother, Myself and My Husband for the small bears (my Husband has been with me for over 10 years now and my Mom considers him one of her "kids" too). At the bottom of the ornament it says "Merry Christmas! 2012". After looking at the pictures I noticed that there are two small circles of paint splotched on the right bear. Honestly, I didn't notice it in person and it just adds to the uniqueness of the ornament in my opinion. It serves as a reminder that someone actually hand painted this ornament just for us. Other than that little splotch, the painting is pretty flawless on this ornament. The ornament itself is very well made. It is heavy, but light enough to stay on the tree. It hangs by a red ribbon that is threaded through two metal loops on the back of the ornament towards the top (you can slightly see them in the pictures). I am confident that this ornament would last for generations if taken care of. These ornaments make great gifts for your sentimental family members (think Mother's, Grandmothers, first time parents, etc). I haven't even told you the best part yet: Ornaments with Love have great prices. These would be fantastic frugal Christmas gifts. Make sure that you order soon and give them a little before Christmas if you want the recipients to be able to enjoy them this year. Disclaimer: I received the above ornament in exchange for this review. I was not compensated in any other way. All opinions are 100% my own. i LOVE ornaments and personalized ones are the best!! i don't have facebook though so i can't participate in the giveaway lol. i will have to check this site out! It was such a hard choice! I liked so many, but I love, love, love this one!!!! I like the Personalized Texting Queen or King Christmas Ornament. Perfect for my daughter.